Very sad news. It will be interesting to learn the cause, as determined upon completion of investigation. The news photo shows a wrecked Union Pacific engine. I wonder what that is all about? Very sad. One has gotta think it will take weeks to clean up. So sad. Run-through interchange power as I understand it. Railroads have been doing it for a few decades now - the accountants sort out the horsepower-hours later. A horrible situation, Albert - starting to see unconfirmed reports of a runaway situation and a recent crew change. There will be some hard-to-hear stuff coming up I think. 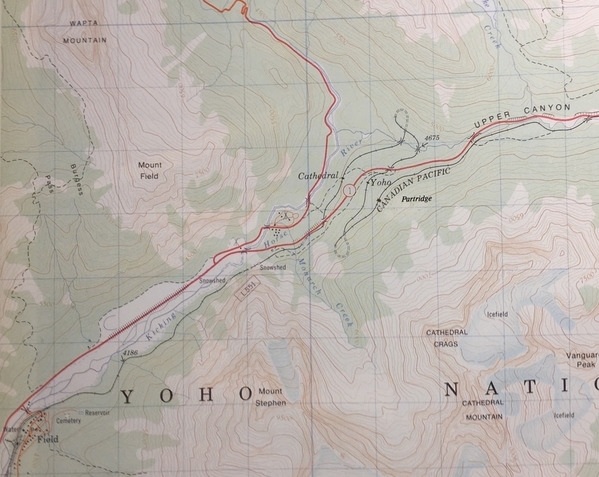 Here is a map showing the area in question. Reports say the locomotives fell 160m into the river but I don’t believe the bridge is that high at this location? Mountain grade railroading is always dicey. On most trips it's uneventful, but, when one little thing goes wrong, you can have coupler failures and derailments going upgrade, or a runaway going downgrade. Going downgrade, you're always about one minute away from having a runaway, if speed unexpectedly begins to increase. Weird things can happen. This train obviously got away from the crew, and, from the look of the terrain, there may not have been a good place to jump off. May God grant them eternal rest. More from Railway Age, with a prelimiary report from the Canadian Transportation Safety Board, and corrections to the map in the previous link showing the location and diagram of the derailment site. --A change-off between crews had occurred at this location as the previous crew were closing in on their maximum hours of service. --There were no hand brakes applied on the train. The train then accelerated to a speed well in excess of maximum track speed of 20 mph for the tight curves and steep mountain grade. and the(n) derailed. There is more in the link--I didn't quote the entire article. More from Railway Age, with a prelimiary report from the Canadian Transportation Safety Board, . 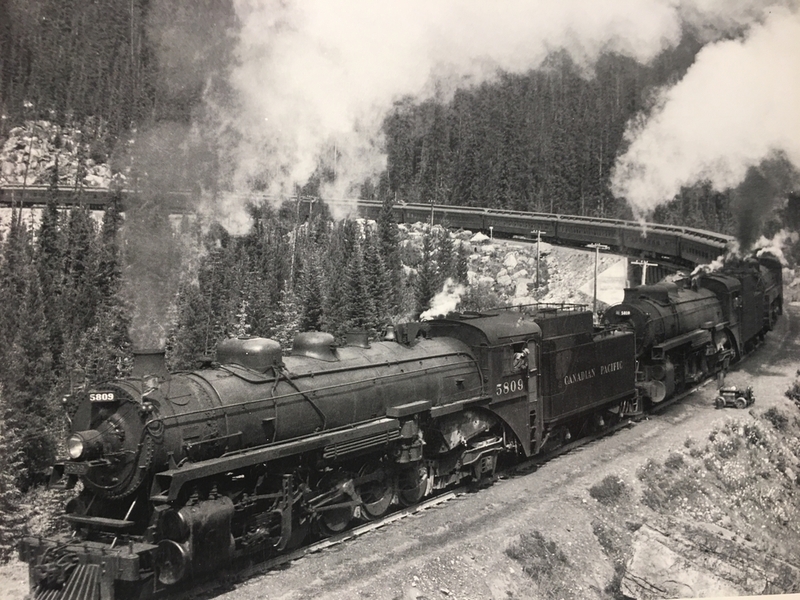 . .
--The train had been stopped with the air brakes applied in emergency at Partridge, the last station prior to the entrance to the Upper Spiral Tunnel. (the train had been stopped this way for two hours--on the grade)--There were no hand brakes applied on the train. The train then accelerated to a speed well in excess of maximum track speed of 20 mph for the tight curves and steep mountain grade. . . The findings on these yet-unpublished queries will be the path to determining the contributing cause(s). From the information that has so far been released, the root cause has already been found: failure to secure the train with hand brakes to prevent movement of the train before the air brake system had been recharged, on a 2% descending grade. But why? That is the question. Nobody on the second crew remains alive to testify, so -- in addition to the first crew -- investigation into CP's process for monitoring the compliance of its crews may tell us whether improper practices were or were not commonly engaged in. I'm no air brake "expert" by any means, but one thing I do remember; when the brake valve is place in the emergency position, the Pressure Maintaining feature is disabled. Thus, why in the world would the pervious crew have placed the train in emergency, approximately 2 hours prior to the replacement crew's arrival? Without any pressure maintaining, sooner or later, the brakes will release, and with no hand brakes applied,,,,,,,,,,,away goes the train on the down grade! The subsequent investigation and interviews of personnel involved it this disaster will surely be very interesting. That's a good question, "why did the previous crew put the train into emergency rather than a full brake application? I'm assuming the dynamic brakes could not hold the train and as soon as the air was recovered the brakes released, with not enough time to fully charge the train line and the train moved out on it's own. However a train left in emergency should not Bleed off in a few hours. There must be something else going on.. Question ....what happens to DPU units inside a tunnel? Do they stop loading, What happens to the dynamic brake on these units with loss of radio communications. * The previous crew did not properly secure the train. * The replacing crew did not properly secure the train and properly charge the brake line before proceeding downgrade. Having railroaded routinely on 2.69% grades, often times with nothing but air (no dynamics), and this includes having to double the grade, etc, such grades are very demanding and you simply cannot run the risk of not having your head cut-in at all times. Make one "small" mental mistake (or series of small mistakes) can lead to disaster, such as this. I would often run passenger turns to the summit town, run around, re-couple, and head back down the grade for the return trip. I ALWAYS gave adequate time for my brake system to recover from the run-around move BEFORE I started down the mountain. I also EXPLAINED IN DETAIL what I was doing to new Conductors (that didn't understand why I didn't whistle off and get on with the show) as well as any new Engineer/Conductors I had with me. Steep grades are serious business. Reportedly, the new out-bound crew had not yet attempted to "recover the air brakes", as the train moved out on its own. Maybe the outside temperature being below zero degrees F may have had something to do with it. Question ....what happens to DPU units inside a tunnel? Generally, nothing as there are "repeaters" for the radio signals inside the tunnels. What happens to the dynamic brake on these units with loss of radio communications. As stated above, there is normally no loss of radio communications for the DPU. However, if there is a "loss of radio signal", the DPUs are usually programed to operate at their last received radio communication, or until brake pipe pressure is reduced, then they drop to idle (when in DP, they may continue to provide braking effort). The preliminary report also said: "Sixteen cars of a CP train derailed on Jan. 3 in the same area. No one was hurt in that derailment." I took the Rocky Mountaineer through this area about six years ago. 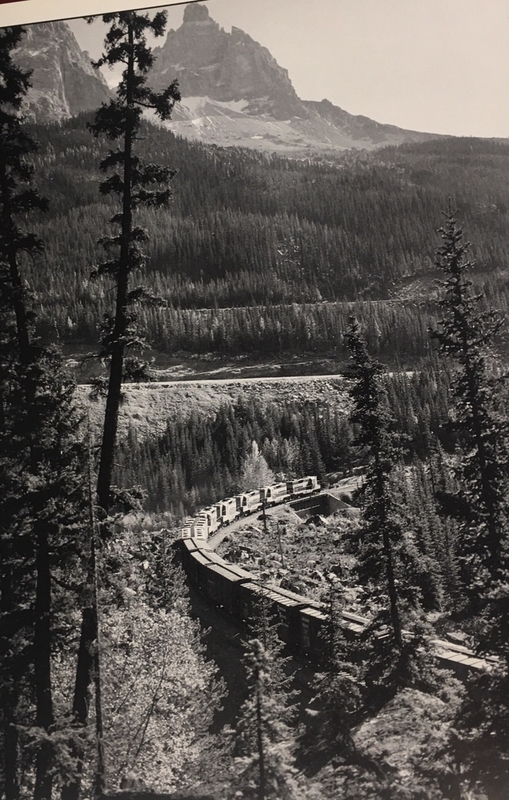 The Mountaineer passed about 10 wrecked freight cars alongside the track near the upper tunnel. It is obvious that this is a dangerous grade that requires special attention and train handling from crews to prevent accidents. It will be interesting to learn what CP's procedures/rules are for trains in this area and if they are being followed. Of course, the other explanation may be that there was a catastrophic equipment failure that no crew could have overcome. That is why there are specific rules requiring the application of sufficient, or ALL, hand brakes, prior to trying to recover the air when stopped on a grade. It appears that the UP locomotive was leading. Do UP and CP locomotives have the exact same controls in the same location? Could a difference in control and or control location affect train handling? I know that whenever I rent a car I need to locate the headlight and windshield wiper switches before I leave the parking lot. I had a scary experience in a rental car many years ago when I got into a sudden rain shower and I couldn't find the wiper switch for several seconds. I was driving blind for what seemed life forever. Comparing RR locomotive cab controls is like comparing apples & oranges. From what I read and from the pictures, it would appear the UP locomotive was in the middle of the train. The lead locomotive ended up on its side in a creek, and the mid locomotive was in a jumble with cars (the UP locomotive is upright). The lead locomotive was too badly damaged for access to the event recorders, so far. Can the DPU locomotive hand brakes be set from the lead locomotive? Of course, I picture the wheel being turned to set them, but perhaps there's a motorized control of them, as well. Hot Water mentioned rules about setting hand brakes on a sufficient number of cars. Is it a percentage of the number of cars? If so - I assume that tonnage of the train (or, perhaps more accurately, average weight per car - empties vs loaded) and the grade are factors - are there others? Temperature? Is the crew expected to know how many to set, based on their training, knowledge of the territory, and the weight of the train? Is there a handbook in the cab with procedures for such an event (not the runaway, just being stopped on the grade)? "“One CP Rail employee — who asked not to be named as he was not permitted to speak on the matter publicly — said the speed limit heading into the tunnels is a maximum of about 20 mph. He said the final radio dispatch from the train as it was heading into the Upper Spiral Tunnel reported a speed of about 47 mph. ‘That’s one of the steepest grades on CP, coming down from the top of the hill,’ said the employee. ‘There’s actually instructions in our timetable about how to come down that hill, like where you should be setting the brakes here and here. It’s very specific and if you do one wrong move, you’re done for.’ The employee said that protocol dictates an emergency brake be applied if a train reaches 3 mph over the limit on that stretch of track, suggesting that cold weather or a mechanical failure may have been a factor. A second CP Rail source confirmed the train’s speed when exiting the tunnel was well beyond the mandated limits. [Teamsters Canada Rail Conference] representative Greg Edwards said he doesn’t know if frigid temperatures played a role in the crash: ‘Cold isn’t good for train brakes and things, but we’ve been operating in the winter for years and years and years.’”"
I leave it to the experienced engineers here to make of the above what they will. Can the DPU locomotive hand brakes be set from the lead locomotive? Of course, I picture the wheel being turned to set them, but perhaps there's a motorized control of them, as well. Many modern units do have motor assisted handbrake, however it can only be operated from within the cab of THAT specific unit. Hot Water mentioned rules about setting hand brakes on a sufficient number of cars. Is it a percentage of the number of cars? A lot depends on each individual railroads operating rules, for SPECIFIC grades. In this particular case, the CP rule book for THAT territory does indeed state "ALL HANDBRAKES". If so - I assume that tonnage of the train (or, perhaps more accurately, average weight per car - empties vs loaded) and the grade are factors - are there others? Temperature? Is the crew expected to know how many to set, based on their training, knowledge of the territory, and the weight of the train? Is there a handbook in the cab with procedures for such an event (not the runaway, just being stopped on the grade)? This sounds same song second verse to that oil train which blew up part of a town. IN CANADA! That is, lack of setting handbrakes! The emergency brake application may not have been initiated by the Engineer nor by anyone else on the crew. It could have occurred as a result of an air hose separation or a condition that Distributed Power was designed not to tolerate. If a "no communication" condition exists between any pair of Lead or Remote consists, Distributed Power will tolerate it for a predetermined amount of time, after which it is programmed to stop the train with an emergency brake application. One of the conditions it monitors is air flow, which can indicate excessive brake pipe leakage. Sometimes in curvy territory, air leaks open up and then close if air hoses are defective. Distributed Power knows the position of the controlling brake valve as well as the brake pipe pressure. If a brake pipe rise is detected without the brake valve being released, DP will stop the train. Unintentional brake pipe increases can occur from the air hose problems described above. If the cars were equipped with Load/Empty sensors which measure truck spring compression, an unintentional release could have begun and DP would have used Emergency braking as soon as the release was detected. Lots of possibilities exist. They will be able to determine whether the emergency brake application was initiated by use of the automatic brake valve, by the Conductor's emergency brake valve on the left side of the cab, by Distributed Power detecting an unsafe condition, or by another condition somewhere in the air brake system. They can determine this by expert analysis of the event recorder data from each controlling unit in the train, i.e., the unit in each Lead and Remote consist which was controlling other units coupled to it in the same multiple unit consist. The focus, though, is on why the first crew did not secure the train with hand brakes (every car on the train if it was loaded on a 2% grade). They are Canadian. Surely they have heard of the Lac Megantic disaster, and surely their rules require securing the train with hand brakes under the conditions present when they stopped with an emergency application. That is the root cause: Failure to properly secure the train after experiencing an emergency brake application on a heavy descending grade. The report indicates that the first crew likely had time to do this, while the second crew may not have been present long enough to do it. The reason for the emergency brake application is important, but regardless, the root cause is what I highlighted in bold. And while setting hand brakes, inspecting the train to see what caused the brake application. The article I read said the train sat there at the top for 2 hours? Unattended? Then when the relief crew were on board but not settled in the train started moving on its own ?? I was discussing this trajedy with a long haul Trucker friend of mine and he mentioned the outside temperature was -36c at Field BC that morning. I was never in this situation of changing crews between terminals, so it raises a question in my mind (and it may be an eye-roller) . Before proceeding, should the fresh crew build air---make the prescribed reduction---cut out the air and do a leakage test before proceeding? If I was taking over a train about which I knew nothing, then take it down Kicking Horse Pass, I would want some information first. Precisely Rob, which is why I am perplexed my previous post which outlines CP policy was removed. Why would they not change at Hector? This is a few miles east of Partridge siding and is located at the Continental Divide? Albert, the crew change may not have been planned for that location. That's where the train stopped from an emergency brake application and the process -- if done correctly -- for securing the train, recharging and reapplying the air brakes, releasing hand brakes, and then proceeding may have been too time consuming for the remainder of the first crew's remaining hours of service time. And the crew may have placed the train in emergency because speed was increasing in spite of a heavy reduction. You can't ride a heavy reduction down a mountain at speeds above 15-18 MPH without causing damaging heat to brake shoes and wheels. Your brakes may not last all the way to the bottom of the grade. Or perhaps the crew put the train into emergency because they were approaching a red signal too fast to stop before passing it any other way. Or, maybe one of the conditions I mentioned in my previous post caused an undesired emergency brake application. Regardless, a train cannot sit indefinitely on a heavy grade with air brakes in emergency, and the cold temperature was surely a factor in the time it took for the train to begin rolling on its own if leakage was the factor. There's not enough information in the preliminary report to determine why the emergency brake application occurred, but, if the train had been fully secured with hand brakes it would have remained stationary, even if the brake cylinders on the cars leaked down. That is a given. Period. Interesting to compare the "news" stories with the comments of the folks on this forum who actually run trains and know the rules. Assuming a 70 car train, about how long would it take to set the hand brakes on all of the cars?